Welcome to Farina Station where the adventure begins. No theme parks here, just down-to-earth, welcoming people, that are willing to open up their rich world of experience, can be called a theme. Kevin and Anne Dawes have lived and brought up their family on Farina Station, we’ve seen and experienced this country in its extremes, from floods to droughts. Let us share it with you. 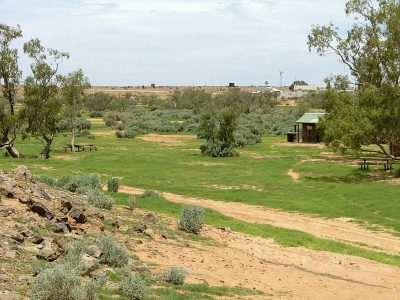 You might be looking for a place to relax and spend valuable time with your family, away from the hi-tech distractions of modern city life, or on your way to Alice Springs via the old Ghan route, Lake Eyre (Kati Thanda), trekking up the Birdsville Track or even to Andamooka and Roxby Downs (the back way). Farina Station offers Camp Grounds, Historic Ruins (Farina Township), Shearer’s Quarters and Tours. During the months of June and July, the Farina Restoration Group can be found restoring the old buildings of the original Farina Township, as well as running the Old Underground Bakery and conduct tours of the old township. The baked goods are widely renowned for being delicious! Experience Farina sunsets, and the clearest of night skies. Camp under ancient shady gums by a welcoming campfire. Barbecues, tables, showers and even flushing toilets are provided in this natural setting. Most Next G mobile phones work from the top of the hill by the camp ground. Firewood is for sale or bring along your own. We do not take bookings for camping but do appreciate large groups letting us know when they are coming. Our shearer’s quarters sleep 16. Great for ‘retreat’ type groups and non-campers that still want a down to earth experience. Remember this is a working sheep and cattle station so it is a true Aussie experience. The quarters contain bathroom, laundry, TV, fans, a basic self-contained kitchen. Outside there is a barbecue and wood heater. You’ll need to bring your own food and bedding. Groups of up to 4 people can be accommodated in our self-contained Men’s Quarters by the homestead.